A quick update on our experiment with freeze dried Thrive foods: they’re even better than I had hoped. We’ve been gone one month now; the freezer is almost empty, the fresh food we bought in Marathon is long gone, we have some canned beans and tomatoes, but we are still eating like kings! Between the freeze dried food and the whole grains we carry, we have an incredible variety of menu options. We are now nearer to civilization, so we have access to island markets (supplies limited between mail boats), but normally at this point in a trip we’d be stuck with simpler options like oatmeal with raisins for breakfast, PBJs for lunch, and rice and beans or spaghetti for dinner. I feel an unspeakable joy to serve a dish with all the colors and aromas of fresh fruits and veggies when I’m hundreds of miles from the closest farmer’s market. Some of the dishes in which I have used Thrive foods (in parentheses) include: BBQ chicken pizza (chicken), spaghetti with meat sauce (beef crumbles), pepperoni pizza appetizers (mozzarella), baked potato soup (potatoes, celery, broccoli, onions and cheddar cheese, milk and sour cream), baked oatmeal (green apples, eggs, milk), minestrone soup (corn, peas, spinach, green beans, carrots, onions, bell peppers), pancakes with berry compote (eggs, milk, strawberries, blueberries, raspberries and blackberries), sausage and cheese griddle bread (sausage crumbles, cheddar), frittata (sausage crumbles, spinach, mushrooms, broccoli, bell peppers, onions, cheddar), chili (bell peppers, onions, beef crumbles) and chicken and dumplings (celery, onions, carrots, peas, green beans). Where they excel is in one-dish dinners—simply throw in a handful of this and a handful of that and voilá! Gourmet meals in minutes. 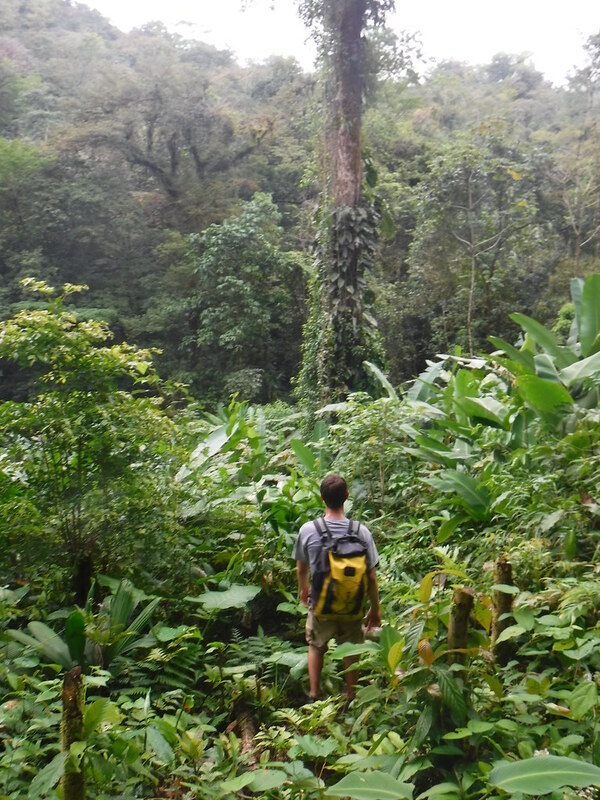 Limitations might be that I didn’t carry enough fruit (we could have been drinking smoothies this whole time! ), and that the vegetables and meats are best used as ingredients and not served as a side dish (for example, it would be better to put the green beans in a casserole than to cook and eat them alone). One reason may be that when you rehydrate veggies or meats in some kind of broth, they take on the flavor of the dish and taste that much better. The only exception is butter powder: I wouldn’t sauté anything in it, but reconstituted with a little bit of water and expeller-pressed coconut oil, it becomes the most wonderful spread for fresh-baked bread or pancakes. A quick survey of the crew of Take Two would find them very satisfied with dishes coming out of our galley, with my Thrive substitutions virtually indistinguishable from fresh ingredients in favorite recipes. We love this remote and rugged island chain for its clear blue water, its dramatic rocky terrain, and its idyllic deserted beaches. It is rare that you share a beach (and sometimes a whole island) with another person, and if you do see someone else, you merely hop in your dinghy and zip over to the next, less-crowded beach. What follows is a summary of our stops on this trip. March 22, Highborne Cay—We picked up where we left off two years ago, at a familiar anchorage with a pretty beach, good snorkeling, and plenty of calm, clear, shallow water for swimming. 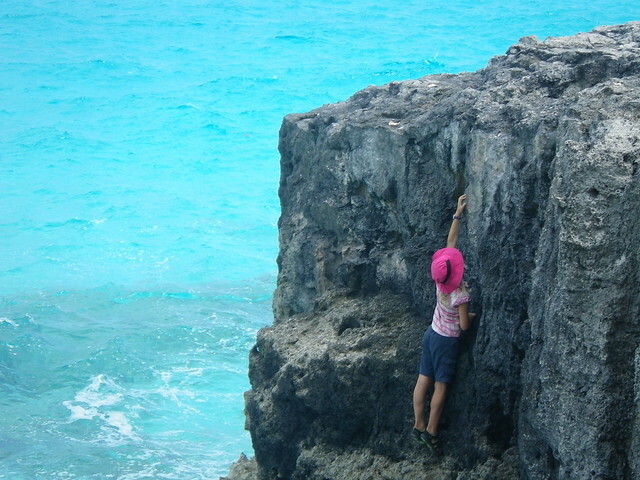 Our kids have a great love for two things: swimming and climbing. The Bahamas has plenty of both, so sometimes it feels like a giant playground made just for us. 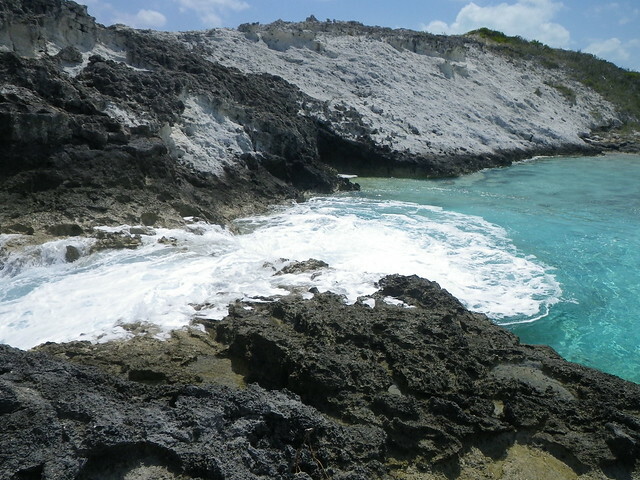 March 25, Warderick Wells—The Exumas Land and Sea Park is probably one of my favorite places on planet Earth. We anchored at Emerald Rock and returned to the park headquarters on Warderick Wells. We did some hiking on familiar trails, actually saw a hutia on Hutia Hill (it looks like a giant hamster), looked for friends’ boat names on driftwood up on Boo Boo Hill, climbed around near the Blowholes, and spent some time on one of those idyllic beaches. 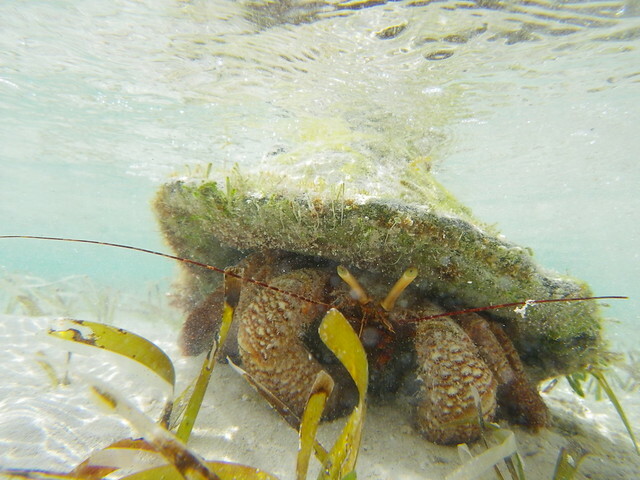 There we found the biggest hermit crab we have ever seen. March 26, Hog Cay—Hoping to branch out from the familiar, we decided to spend a day exploring the southern end of Warderick Wells. We hiked to the Davis ruins, a Loyalist settlement dating from the late 1700’s—two stone walls and the foundations of a few buildings—up on a hilltop. Great view, but I found myself wondering how anyone could survive on an island where nothing grows and the only fresh water is rain that gathers in the natural indentations or “wells” in the limestone bedrock. I’m guessing they ate a lot of seafood. 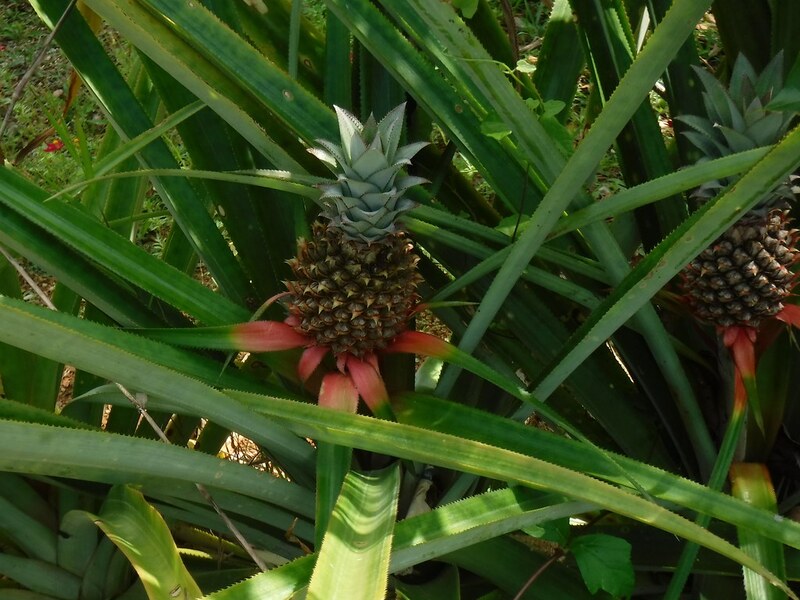 Rumor has it that they were attacked by the pirates that occupied the southern tip of the island. There is a simply breathtaking harbor (aptly called “Pirate’s Lair”) where a ship could lie in wait in the deep harbor hidden between Warderick Wells and Hog Cay and attack passing ships. “Capture Beach” was a favorite hangout of these ne’er-do-wells, and “Escape Beach” on Hog Cay was where we parked our dinghy to stop for picnic lunch and play. 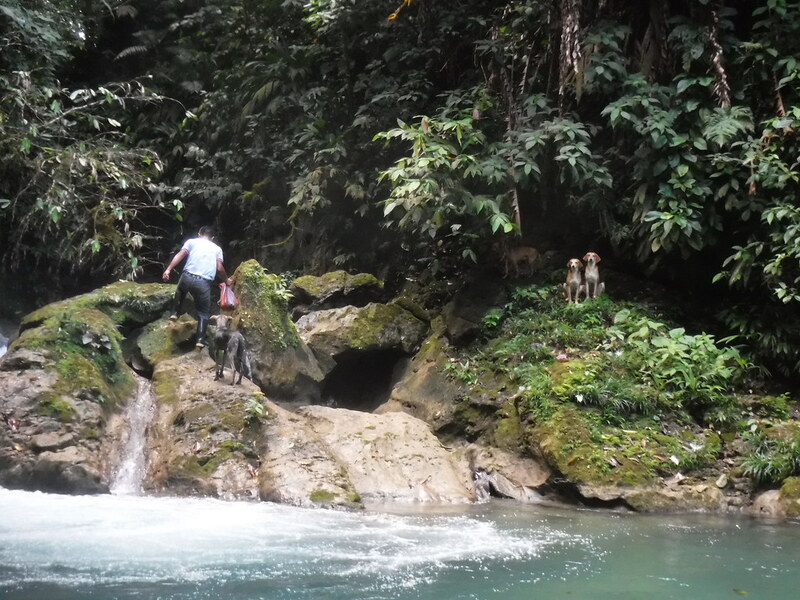 The kids disappeared immediately, having found cliffs and boulders to climb. 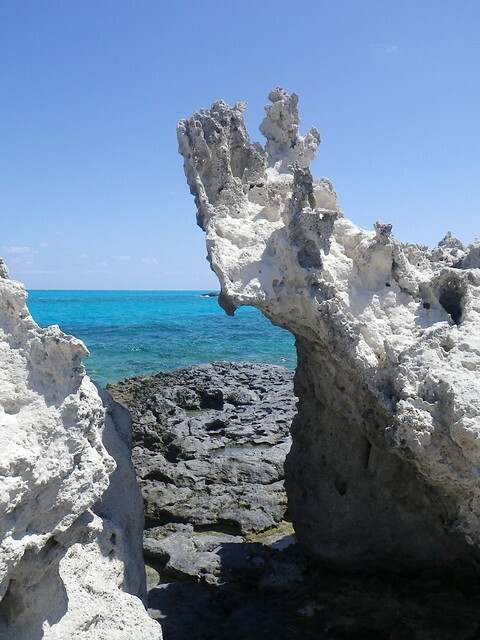 Hog Cay has some beautiful features—large rocky ledges, a tunnel where the water flows from Exuma sound into the harbor, tide pools, hilltop vistas and sandy beaches. Even though we didn’t find any pirate treasure, it was a gorgeous spring day and perfect for this kind of exploring. 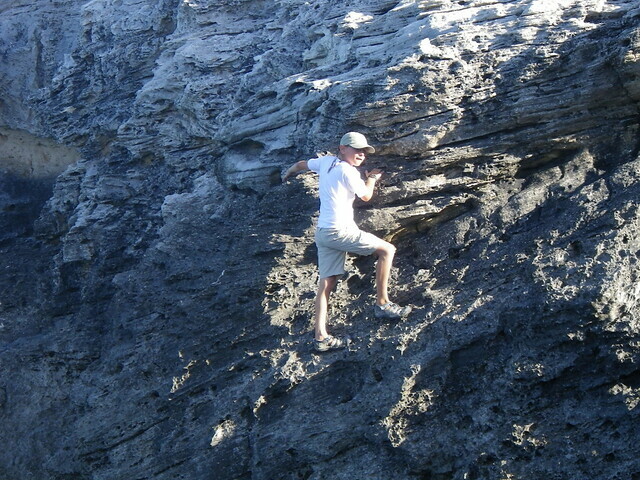 March 27, Cambridge Cay—We moved on to Cambridge Cay, where there were more climbing opportunities and an even more beautiful, deserted white sand beach. We took a park mooring ball for a night and watched a spectacular moonrise from a calm bay. We kept the family tradition of storytelling and stargazing on the trampolines. The next morning we went to the south end of Cambridge to snorkel right off the beach. There were some rare and beautiful Elkhorn coral formations, but we were also sad to see a lot of damage and bleaching. The beach itself was perfection, and the water like an endless swimming pool. We chose this setting to baptize the four oldest children (which was something they had been talking about for a long time) and then went back to the boat for cake to celebrate. March 28, Compass Cay—Our next stop was Compass Cay, home of the Compass Cay Marina where you can jump off the dock and “Swim with the Sharks” (for a small landing fee of $10/person). The kids were nonplussed, as they were tame nurse sharks—they swim with nurse sharks that hang out under our boat all the time (for free). 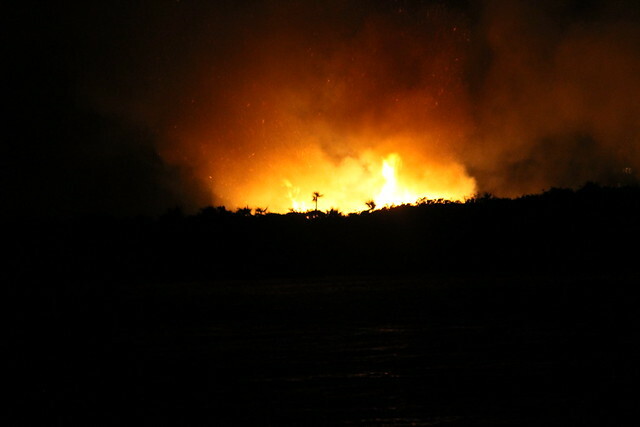 We anchored near Pipe Cay and witnessed a huge wildfire just after sundown, the cause of which was a stray spark from fireworks set off by one of the marina guests. And we thought the fireworks were exciting! The next day we spent cleaning the boat and preparing for Passover, which we celebrate as part of our family’s Easter tradition. The morning of the 30th we explored Compass Cay by dinghy and found it to be as beautiful as the guide book said, with a crystal-clear mangrove creek, a hike up to Compass Point (elevation 92 ft.), pristine beaches and a really unique feature called “Rachel’s Bubble Bath.” This is a tidal area with sandy flats that flood during high tide. The ocean’s surge passes into a limestone bowl through a crack in the rocks and all the sea foam gathers in the bowl and looks like (you’ll never guess) a bubble bath. 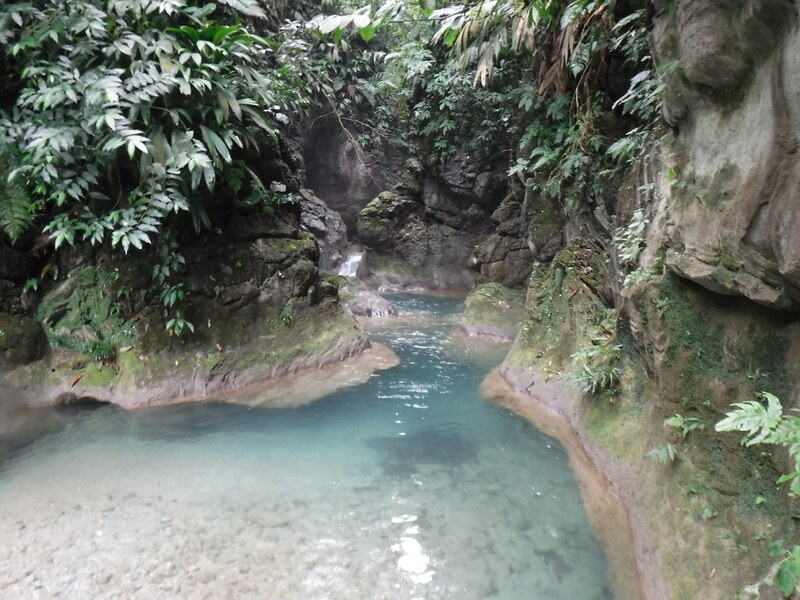 On a warmer and less-windy day, it would be a perfect swimming hole. 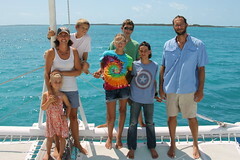 March 30, Sampson Cay—Looking for protection from the wind, we moved to Sampson Cay. There is a popular marina and club there, but it seemed very quiet for Easter weekend and we saw almost no other people. We scoped out a few of the small islands nearby and found one with a hidden beach. As it had no name on our chart, we decided to claim it for our family and dubbed it “Robinson Island” after the Swiss Family and Robinson Crusoe, of course. We enjoyed a day of sandy, salty play on our very own private island. April 1, Staniel Cay—Hoping to make it to the Batelco station to pick up a local phone/SIM card and try out their new network, we went ashore at Staniel Cay. No luck with the phone—it was a holiday. No, not April Fool’s, but Easter Monday. We expect this sort of thing to happen in the islands. We did have good luck at Pink and Blue, however, the two grocery stores on the hill. They are more like tiny cottages than supermarkets, but if you get there just after the mail boat comes, they have eggs, butter, cheese and fresh produce in addition to the canned goods they usually carry. I found everything I needed to refresh my supplies on the boat at Blue, so we waved to the ladies at Pink and headed back to the boat. April 2, Black Point Settlement, Great Guana Cay—We left Staniel, which we really don’t like and headed for Black Point, which feels more like a family place. 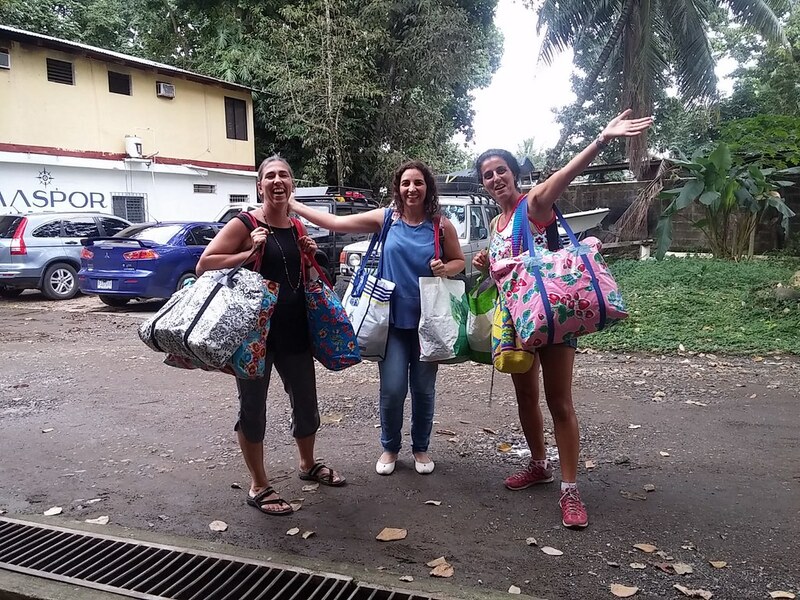 We had been here before, and when I took laundry ashore at Rockside, the owner, Ida, remembered our family. This is my favorite Laundromat anywhere. Ida always has a freshly-baked cake in her welcoming store, and keeps the Laundromat impeccably clean. And you can’t beat the view. It becomes the popular gathering place for cruisers with clothes to wash and stories to unload. Jay tried the Batelco station around 11 AM, but it was locked, with hours posted as 9-12 on Tuesdays. Island time, I guess. While the laundry was drying, we headed to Lorraine’s Café for burgers and fish sandwiches. 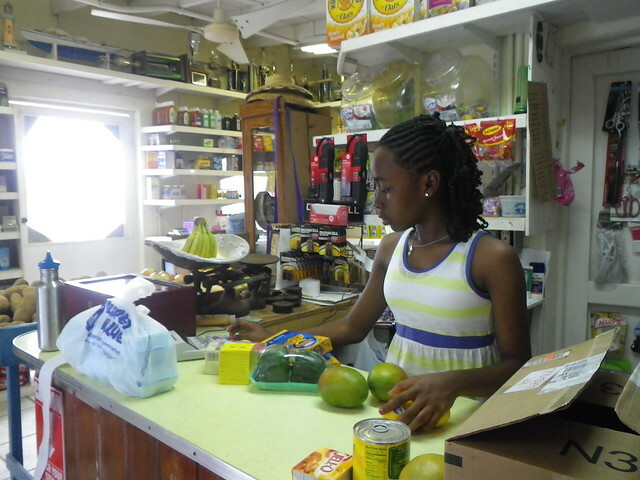 I also bought two loaves of still-warm coconut bread from Lorraine’s mom—the best I’ve had anywhere in the Bahamas. We collected some sea glass from the ocean beach on the East side of the island, spending another beautiful afternoon on a deserted strand. April 2, Robinson Island—We returned to our own private paradise to anchor for the night, with hopes that it would be calm enough to have a bit of fireside fun. It was a perfect evening. I made a pot of chili, packed up tortilla chips, cheese, a bottle of wine, and S’mores supplies and we headed to our little beach just before sunset. There was just enough daylight left for gathering firewood and setting up dinner around the fire. This has to be our favorite part about finding deserted beaches—no signs, no rules, no one to tell you “No.” After witnessing the fire on Compass, we were especially careful. We stayed until we had burned every stick we’d gathered, and the fire was nothing but gently glowing embers. We covered the fire with damp sand, and tried to erase all evidence that we had been there. 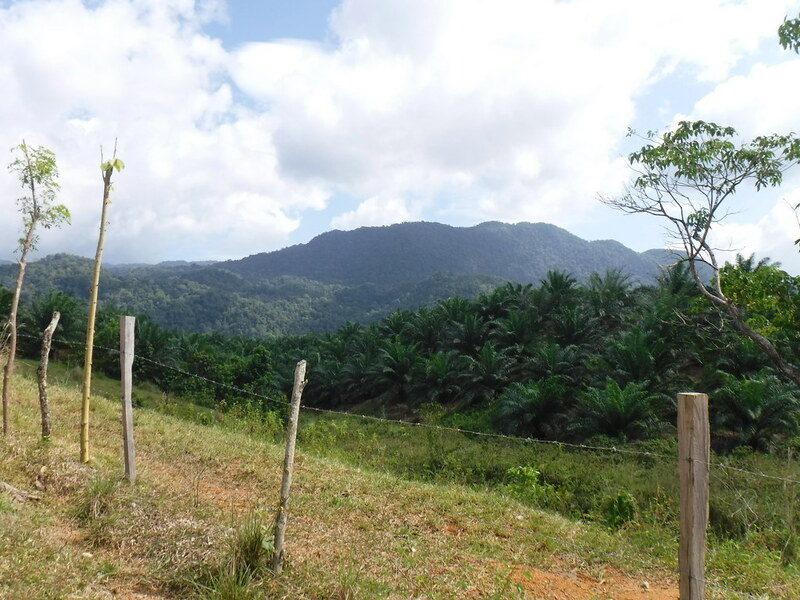 We hope to keep our island in pristine condition. April 3, Shroud Cay—A perfect breeze made for a gorgeous sail north to Shroud Cay, what is, to me at least, the crowning glory of the Exumas Land and Sea Park. With miles of mangrove trails, long, white ocean beaches, and beautiful swimming holes, it has something to offer everyone. Immediately upon setting the hook, Jay launched the kayaks (twin yellow Ocean Kayak Malibu Two’s) and the kids and I geared up for an explore. While I love the deep, dark, swampy tangles that make up Florida mangroves, nothing compares to the beautiful contrast of Shroud Cay’s crystal blue channels and lush green leaves topping red arched roots. 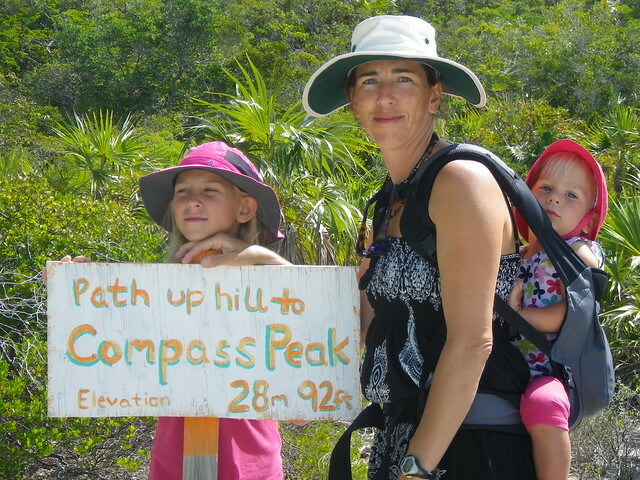 We took the southern trail which connects the Western side of the island to Exuma sound. The beach sand there is so fine it squeaks when you walk on it, and the deep tidal channel is perfect for cooling off after the hard work of paddling upwind. The downwind paddle was relaxing, though we missed a turnoff and ended up paddling home through an alternate outlet and across choppy open water to the boat. 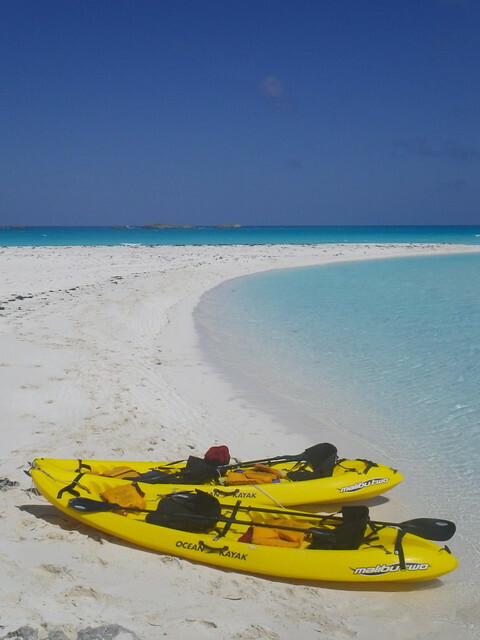 April 4, Shroud Cay—Another beautiful day, another kayak trail to explore. The other kids being tuckered out from our previous paddle, Eli and I hopped in one kayak to explore the trail across the middle of Shroud Cay while the others took the dinghy on the trail to the north. 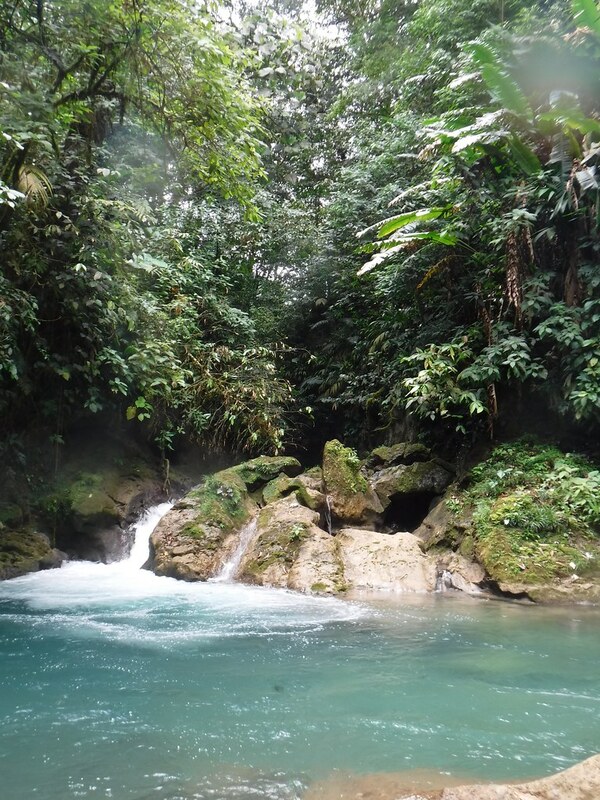 They found what they said was the perfect swimming hole, with a steeply inclining beach for big-kid swimming and a shallow sand bar where Rachel could safely play. 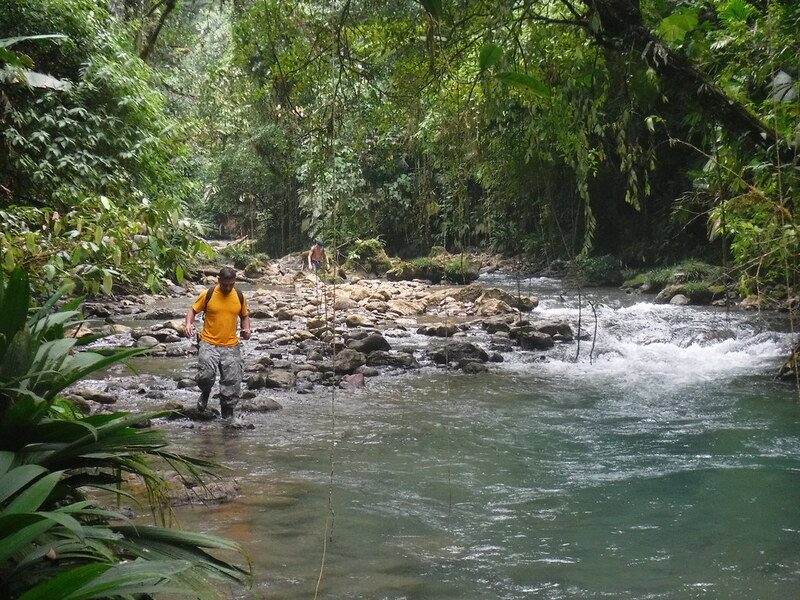 Eli and I found a long, clear trail that got gradually shallower and shallower until we were walking alongside the kayak through sandy shallows. We pulled the kayak out onto the sandy bank at low water and tied it to a mangrove root. A hike over tidal flats and through Casuarina forest revealed (yet another) deserted white sand beach. After a long walk, a cooling swim, and a drink and a snack, we hiked back to where we had left the kayak and found it floating on an incoming tide. Though the tide was rushing in, the wind was at our backs, so the paddle back was easy and pleasant. We found a swimming hole on the way out where we could jump off the rocks into deeper water, so we cooled off there before heading out of the mangroves and back to the boat for lunch and a nap. April 4 Highborne Cay—We returned to what has unexpectedly become our favorite anchorage in the Bahamas, the north cove of Highborne Cay. With a cold front coming, we needed a protected place to spend a couple of nights. The front brought only some gusty wind, but dumped buckets of rain, so we got a free de-salting wash-down. We awoke April 6th find a big beautiful blue day before us. 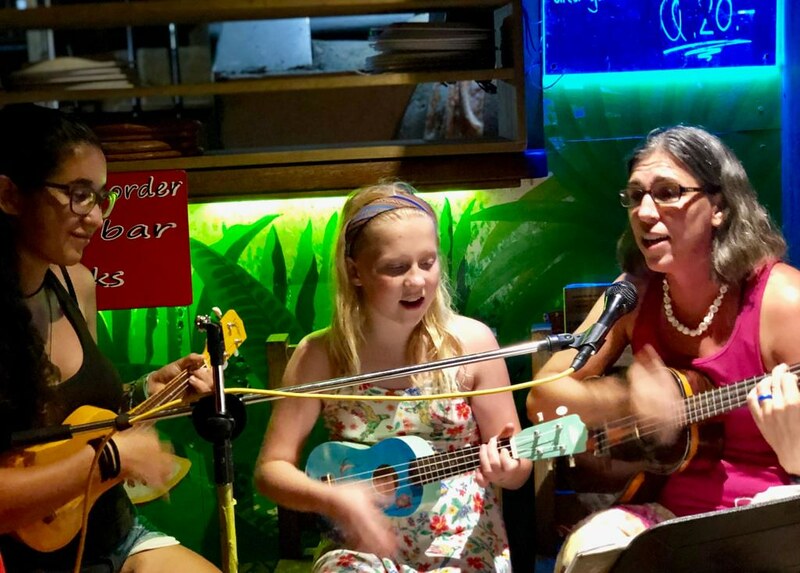 April 6, Leaf Cay—We took Take Two over to Leaf Cay for some beach fun and iguana chasing. After lunch and birthday cake (for Jay’s 38th), we went ashore with beach toys and chairs and some Romaine lettuce. Jay hadn’t even secured the dinghy before Eli had caught a Rock Iguana. Evidently they aren’t very smart, though they are pretty quick. Sarah managed to trick one as well, though she got scratched up a bit in the attempt. By the time Aaron got into the game, the wary iguanas were coming close enough to nibble the edge of the lettuce but not close enough to get caught, much to his chagrin. Sam and Rachel seemed content to throw lettuce and then back away as several iguanas would scuffle for the offering. Jay and I sat in beach chairs and talked about what we’d like to do next. 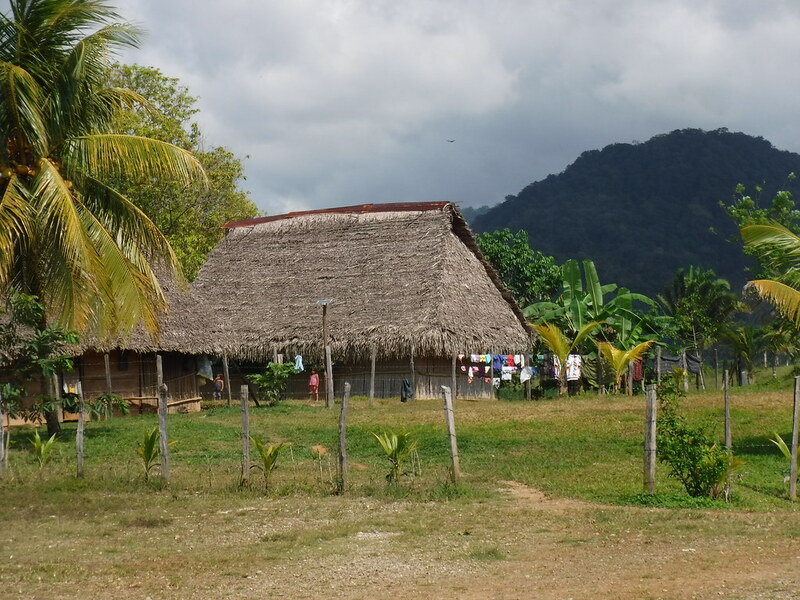 No sooner discussed than enacted—the next posts will be from the Abacos! Our kids are incorrigible lizard hunters. Cubans, skinks, curly tails, green and brown anoles, even iguanas; a lizard seen is a lizard chased. 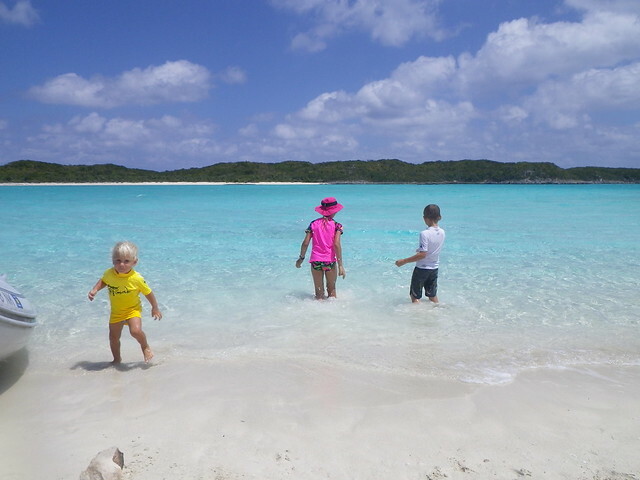 One of the things they really wanted to do on our trip to the Exumas was go back to Leaf Cay. 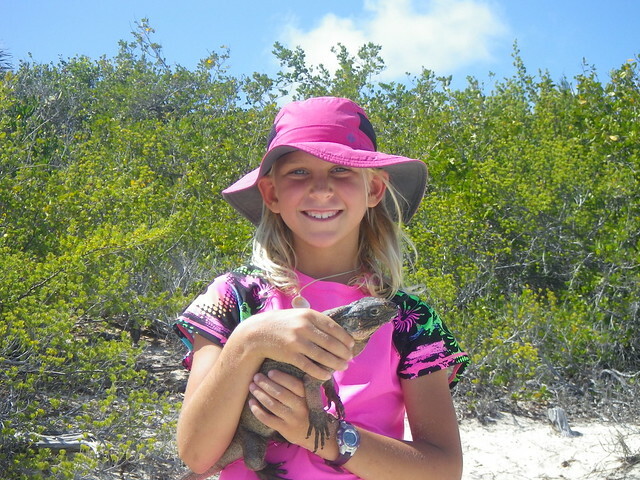 Leaf Cay is known for its iguana population. Go-fast boats full of pasty tourists make a daily run from Nassau to see them and, predictably, the iguanas have gotten used to being fed. The kids were counting on this and came prepared with food — well… bait, actually. The iguanas were unprepared for a coordinated assault from four boat kids. Our kids love a beach fire and are always on the lookout for a suitable place to make one. Unfortunately, it isn’t that easy to find. First there are the physical requirements: sand and wood. 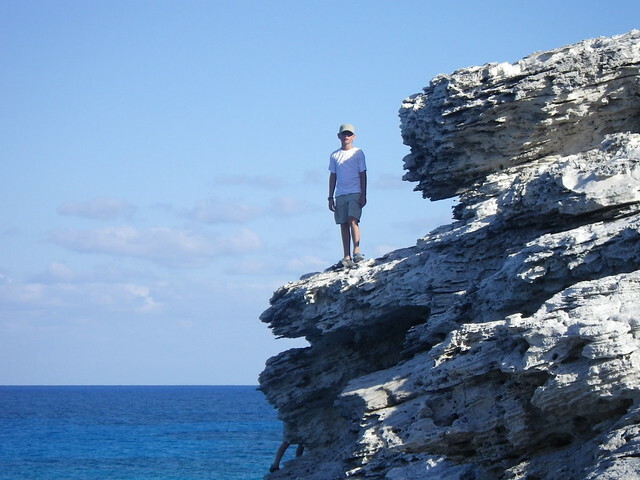 Much of the shoreline in the Bahamas is a rocky marl, or “ironshore”. Not a place you want to land your dinghy. The island must have trees from which to gather firewood. It must be near a place we want to park Take Two for the night, and the way back home must be navigable by dinghy at night. Finally it can’t be inside the Land & Sea Park, or on a private island, and I don’t really want it visible by anyone else at all. So we’re not exactly overrun with opportunities. At one point during our trip, we were anchored south of Compass Cay and thought we had found a good location for a beach fire on a neighboring island. It had been a busy day, and we weren’t planning to move the next day, so we decided to defer the fire. That night someone was shooting fireworks from the vicinity of the marina on Compass Cay, probably from one of the big fancy yachts in there. After a long day of zooming around on jetskis, fireworks and loud music are the perfect way to unwind. The show appeared to be over, but then Sam alerted us that now they were having a bonfire! Clearly it was no bonfire, but a fireworks-induced brushfire somewhere between us and the marina. We watched it rage for hours beyond the ridge of the island nearest to us. The breeze was strong and it was helping the fire spread nicely. We tried to determine exactly where it was in order to predict the extent of the potential damage, but in the dark it was difficult to tell. Eventually the fire burned low and we went to bed, expecting evidence of it to be readily apparent the next morning. But it wasn’t. Either by dinghy or by climbing Compass Peak, we could find no trace of the fire, though we could still occasionally get a whiff of it on the wind. In any case, it seemed that it was no longer the time or the place for beach fires. 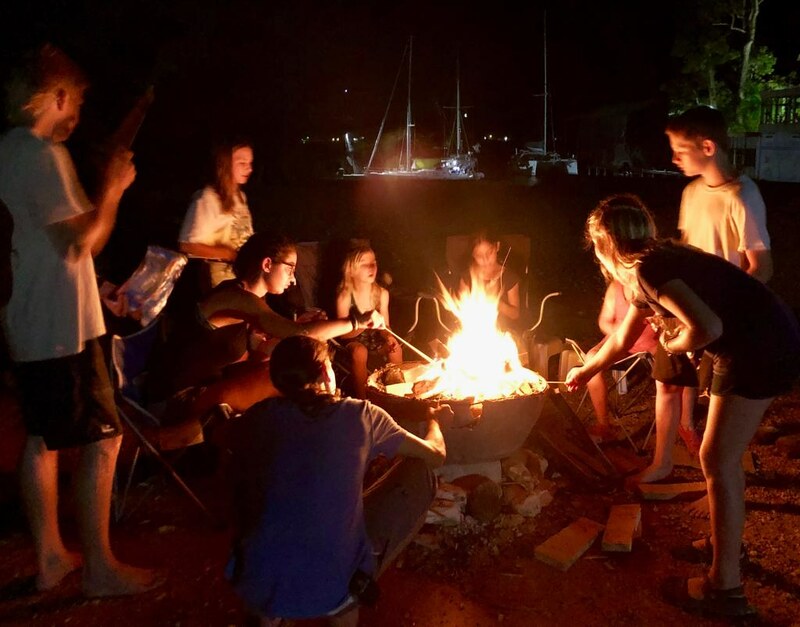 A few nights later, near Sampson Cay, the kids finally got their beach fire. The daydream went something like this: we’ll pick up the hook and sail all night while the children sleep, and when they wake up in the morning and look out the window, they will see something completely new and amazing. We used to tickle ourselves with this idea, especially at the beginning, when we were so bogged down with repairs that it seemed that we would never go anywhere except to the West Marine for parts and the bank to withdraw more money. As with many things in life, what seems to take forever while you’re waiting gets compressed when looking back; it’s been five years this week since we bought Take Two, and although she’s spent a good bit of that time at a dock getting worked on, she’s also taken us to new and amazing places. The things we dreamed about with our young children have actually come to pass. This came home for me as we anchored in the dark a couple of weeks ago off the western side of Highborne Cay in the Central Bahamas. We had used the calm North-westerly breeze to make our way south and east over night from the Berry Islands to the Exumas. It was magical to wake up in the shadow of a new island surrounded by beautiful water. Someone commented recently on how nice Take Two looked (especially for a twenty-two-year-old wooden boat), and asked me how much we had put into her. My response? “Everything.” Every ounce of energy, every spare penny, every drop of love, every moment of our time. When I related this conversation to Jay, he wondered if I regretted any of it. What could I possibly trade that would be worth as much to me as the last five years? We bought the boat in April of 2008, moved aboard August of 2009, sold our house in May of 2010 and never looked back. There is nothing I would rather be doing than living aboard, boat-schooling the children, and traveling whenever we can. Very little of it has been easy—just try cramming 7 people (at least one of whom is an actual toddler) into a tiny, constantly moving space for long periods of time and see what happens. It is a crucible of the character, I can tell you, and the things that rise to the top are none too pretty. But it has been rewarding. We have made countless happy memories that far surpass any of the difficulties or unpleasantness. I don’t know what you dream of doing, or where it is you’d like to go in your life. But even if sailing away is the last thing you would think of, just know that it is possible to envision something and then make the thousand tiny choices that will turn your path slowly but inexorably toward that thing. I leave you with an excerpt from the introduction to Tom Neale’s book, All in the Same Boat. I framed this many years ago and hung it at Jay’s eye level in the bathroom. I like to think it helped motivate us to keep trying and never give up. “But you can,” I say. "But you probably do. It doesn’t take much money; it takes something else. It takes wanting to do it bad enough and making sacrifices; and you have to do things yourself, not pay someone else. You can do it, but you have to work hard and give up things you don’t need anyway.”	Their eyes glaze, they smile wanly, and they change the subject. You can take control of your existence. You can start doing things for yourself instead of for a “system.” You can be a family instead of a splintered group. You can raise your children to understand responsibility, to know self-discipline, and to appreciate real values. And you can know the children you raise. You can breathe clean air. You can see the stars through clear skies. You can fill your days with adventure, and you can walk on white sands and share beautiful sunsets. You and your family can go cruising. But you’ve got to work at it.